You are currently browsing the Science Fiction Brewed Fresh Daily blog archives for the day Friday, February 4th, 2011. 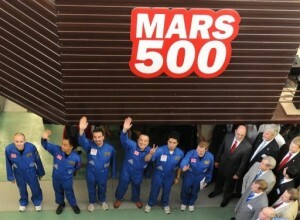 Members of the Mars500 crew wave before being locked into the isolation facility in Moscow, 2010. Three men will simulate walking on Mars next month as part of a project that has seen a multinational crew locked up inside a mock Moscow spaceship since June. After 233 days in a locked steel capsule, six researchers on a 520-day mock flight to Mars are all feeling strong and ready to “land” on the Red Planet, the mission director said Friday [2011.01.18]. The “landing” is scheduled for Saturday, 2011.02.12. The project is designed to help real space crews deal with the confinement and stress of extended duration space travels in the future. The living quarters are designed to simulate the quarters available to a real space crew, and there is a module attached that will simulate the Mars landing site. So far, the Mars 500 crew are all still committed to the project (no one is ready to opt out).